KweenBee and Me: Birds, Birds and more Birds! 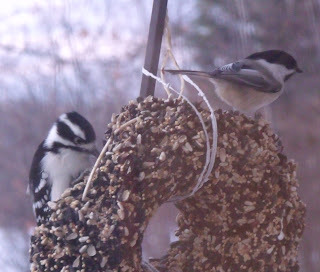 I recently put up a bird feeder to see what sort of birds I would see. The first bird feeder hung there for weeks with not a single taker. 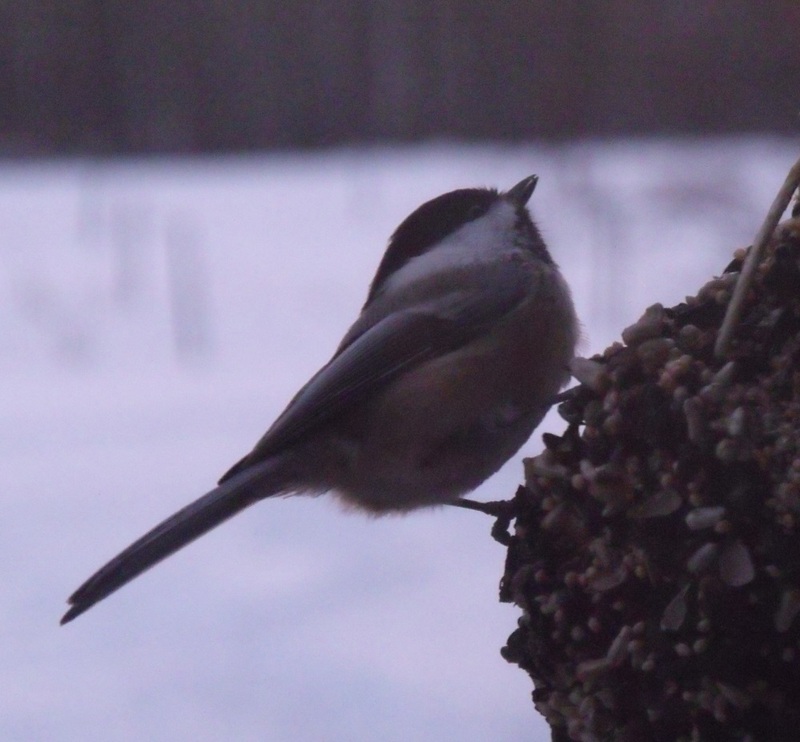 I was doing a little shopping in town and found a bird seed and suet combo and oh boy! What a HUGE success! Once the chickadees found it, the other birds were soon to follow. It looks as though the other birds watch to see where these smart and sassy little birds go and then see what all the fuss is about. 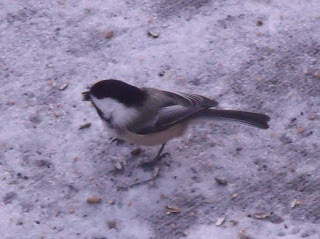 So far we've had mostly chickadees, but we also have two different woodpeckers, blue jays, juncos, some green/yellow birds and some red ones. I've been using the Peterson Birds of North America app on my phone to identify them. I'm still not quite sure about the red and green birds as they may just be passing through and I haven't seen them a whole lot. I have also realised that I am horrible at bird identification. 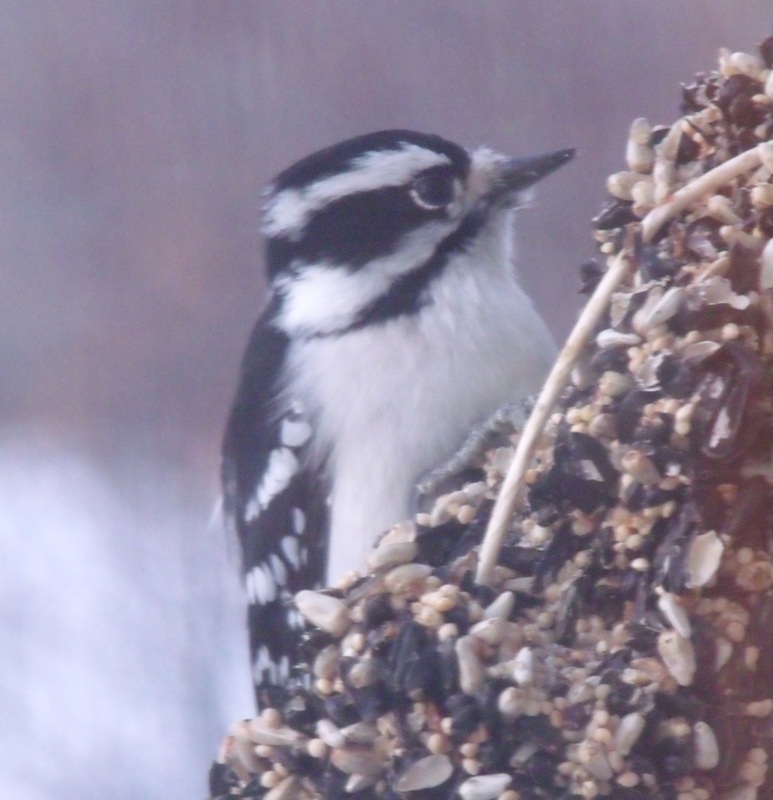 I either have hairy or downy woodpeckers. According to the handy dandy app, both live in the area where I live and they have a huge range. So big in fact that apparently to make this even harder for me there are regional differences in the woodpeckers. The one shown above is the female of one of the species. 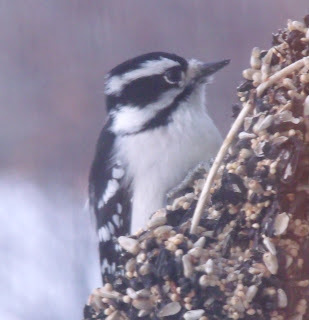 The male keeps coming around and scaring her away from the feeder. What a jerk! She was sitting here earlier this morning before he showed up. He came in much later and now I haven't seen her in a while. I do have to say, is it ever tough to get a good photo of birds, especially chickadees! They bounce around a lot but thankfully they give you plenty of chances and aren't very afraid of people. They are always coming and going, storing seeds and fighting with one another over the food. They are very entertaining to watch! So as not to disappoint, I also managed to get a bit of video of the birds feeding. Hopefully there will be more photos to come. Wish me luck!